Third in a series – Imagine for a moment that the world has been invaded and occupied by an army of robots, and you could only grab a handful of DVDs before you were incarcerated… what would they be? Have you ever watched a film that was so uncannily like your own life that you were convinced that the film-makers were monitoring and recording your every move? For me, LIFE IS SWEET was that movie. I’m not talking about the events in the story, but all the way through there were little character moments that chimed so precisely with the world I lived in (still living at home with mum, dad and sister, in a house too small for us all) that once I finished watching it, I rewound the tape, dragged my mum and sister into the room and made them watch it too. We were used to seeing a sort-of hyped-up reflection of reality in soaps on TV, but they were always done in such a rush, with such a sense of melodrama, that it was hard to take them seriously. 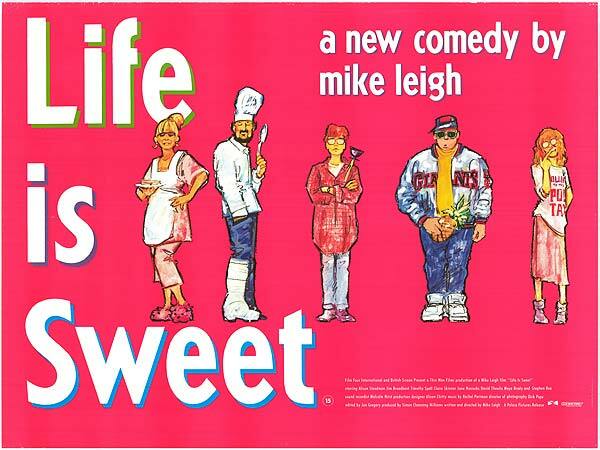 But Life Is Sweet is a Mike Leigh movie. The actors spend weeks, if not months, working on their characters, rehearsing and refining them through improvisation. It’s a fairly unique method of film making, but gives the dialogue a naturalistic rhythm that would look impenetrable on the page. To say that this film was a major influence on my early writing, especially my first play, would be a massive understatement. It gave me licence to write characters that sounded like people I knew. Leigh gets a lot of flack for being patronising to his audience, characters and even the working classes*, but in Life Is Sweet, and the better-known SECRETS AND LIES, I saw truthful representations of ordinary people I recognised, and the trials they faced. Not epic struggles against monsters or aliens, but just people coming to terms with life in an ordinary suburban world. I’m learning that story is all about characters discovering who they are, reconciling the conflicting parts of their own selves. If you can pull that off, whatever the setting, you’ll have the ingredients of a great drama. And Leigh’s films have this in spades. How to flatter a fat* man – writing advice from a nobody. So, yesterday someone asked me for screenwriting advice. Never mind that I have no movie credits to my name (yet), but the news that I’ve co-written a script that’s going into production was enough to send a 22 year-old I’d never met before, pelting down three floors of our office building to seek out my sage wisdom. I was flattered to say of the least, and my ego puffed-up to full as I prepared to dispense pearls of wisdom to this young neophyte. But, as I opened my mouth, I realised that I was one microsecond away from becoming a pompous Robert McKee type, and managed to stop myself. The truth is I don’t have a bloody clue. I managed to piece together a chronology of how I managed to get where I am today, but anyone can do that, and everyone’s story will be different, so what use that is, I have no idea. I also urged her to meet and befriend other writers. Not only are they fun, if slightly mentally unhinged, but we all have the same doubts and fears and share them on Twitter when we know full well we should be working to a deadline. Then I started reeling off lists of podcasts I listen to (and I’ve shared them below), because this has been a big part of my education in writing in the last few years, and these guys all know a lot more than I. And that was it, really. I was all out of advice. I’m collaborating on a new script with a new writer. It’s his first, my umpteenth. And the thing I must not do is start telling him how to write. I have more experience, yes, but to tell him how to write is tantamount to telling him how to think, and that’s how cults and religions and very bad things start. Why do you think they call them script gurus? You can get all of these on iTunes for free, but it’s worth having a look at their related blogs, and do follow them on Twitter too. What sets these guys apart from the Syd Fields and Robert McKees of this world, is they’re actually working as writers in the film industry, so they can talk with authority about how the industry works. This one covers everything from writing techniques, to agents, managers, lawyers, the WGA, writing software, and even fonts (John August also develops apps). It’s been running for a couple of years now, and it’s worth dipping into the backlist, though you can jump in at any time. This is a very American podcast, but if you’re thinking of working in the States, this is very useful. Danny has one of the best UK scriptwriting blogs out there, and, in this monthly podcast, he and Tim Clague talk about writing in the UK. Danny is clearly smart, professional and knows his stuff. Tim now seems to mostly write for games, and never fails to mention that he once won a Bafta for a short film he made years ago (and, to be fair, neither will I when the day comes). Not as zippy or slick as the US podcasts, but invaluable for insights into the UK film and TV industry. Jeff gets an amazing roster of writers talking at great length about how they started, their careers and their latest film. This is American too, but he gets loads of British writers on the show. These are often recorded after a screening, and the audience get to ask questions. He previously presented the Creative Screenwriting podcast, which no longer seems to be on iTunes, but I’m sure you can find it if you go digging online. They were terrific, essentially the same format, but presented in association with the magazine Creative Screenwriting. Not a podcast about writing, but these guys love popcorn movies. They watch them on Netflix (which can skew what kinds of movies are available) then get together over Skype to dissect them. They’re really good at pointing out tropes and plot holes, which is invaluable for a writer. I’ve lost interest recently, as they don’t seem to be covering movies I particularly like, but the earlier episodes on films like Superman and Wrath of Khan are outstanding. Probably the best film show on radio. It goes through phases of being overly self-referential, but Kermode really knows his stuff (even if he never shuts up about bloody 3D), and Mayo keeps him in line. Hello to Jason Isaacs. I bloody love Empire, and this podcast is huge fun. Their reviews tend to be more forgiving than, say, Kermode’s, and the interviews are always good. The hour long specials are wonderful. The Terence Stamp one is a gem. And Helen O’Hara should have her own show. 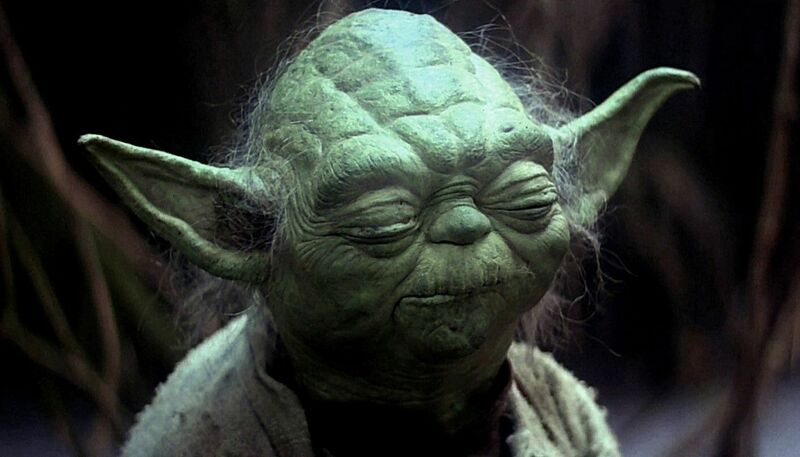 *Okay, so I’m not exactly Jabba the Hutt, but I have a bit of a tum, and boy, do I love to eat. Posted on March 29, 2013 Categories Movies, Scripts, Television, WritingTags advice, craig mazin, danny stack, empire magazine, film, filmsack, how to, jeff goldsmith, john august, kermode, mayo, mckee, podcasts, Screenwriting, tim clague2 Comments on How to flatter a fat* man – writing advice from a nobody. Warning: this post contains blatant name-dropping. Look carefully see if you can spot it. My friend and colleague Jo had for months been urging me to watch the show Big Bang Theory. Phrases like, ‘You’ll love it,’ and ‘It’s just your kind of thing!’ were regularly doled out when I interrupted an office discussion about last night’s hilarious episode. Like many people, I get twitchy when people tell me that I’ll enjoy something. How can anyone possibly know me so well as to pre-empt my tastes? Am I not an enigma? A chameleon of the arts, listening to Mozart one minute and watching Phineas and Ferb the next? And I hated it. Why was the audience in such paroxysms of laughter? They were howling as if this was the funniest thing ever written. I remained stony-faced, waiting for it to click, to suddenly reveal its magic to me. Then I stumbled across this clip with the laughter removed and that did it. I was convinced that it just wasn’t for me. Me and Big Bang Theory were never going to happen. I reported this back to Jo and she looked at me as if I’d just burned down an orphanage. She still managed to work with me and was civil in my company, but I’m sure she felt that from that moment on I was damaged goods. Some months went by and I was invited to dinner with George RR Martin (there it is!). We’d just published one of his early novels Armageddon Rag (available now in all good bookshops!) and while he was in town to promote something called Game of Thrones (never heard of it) he was kind enough to also promote our book. As you might imagine, Mr Martin revealed himself to be an intelligent man of great taste… and he just loved Big Bang Theory. How could this be? Two smart people whom I like and respect both fans of a show that leaves me cold. Is it me? Do I have some kind of comedy gene missing? Fortunately, E4 had at that moment decided to start showing TBBT from episode one and I jumped aboard hitting the series reminder button and mainlining up to 6 episodes a day. And I like it. Actually I think I love it. It’s not the best sitcom ever and it lacks the element of tragedy that the truly classic comedies have*, but bloody hell it’s a great way to decompress after a hard day’s work. It’s a smart as a button, with a rapid pace and great characters. And that’s why it didn’t work when I tried watching it the first time: I was watching an episode from the third series and the audience was howling with laughter because they were anticipating the characters’ foibles. This is why certain sitcoms work so well: we cringe at the tension of George Costanza going in for a job interview because we know he’s going to screw it up, we wince at Ted Crilly’s latest scheme to escape Craggy Island because we know it’s never going to happen. It all comes down to character, not gags. Gags help, they’re often the things we remember, but they’re not why we come back to these shows again and again. 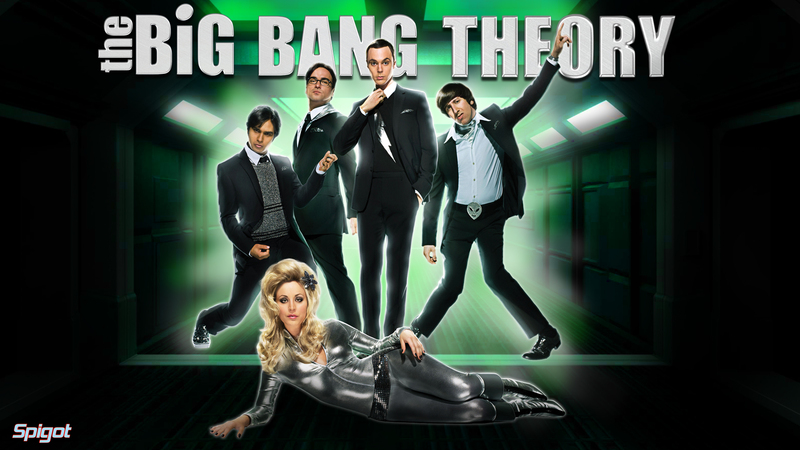 Big Bang Theory is currently at its zenith, but of course, it will have to go through the usual cycle that US sitcoms go through: we’ve already had the unlikeable character who divides the lovers, next will be an overload of celebrity cameos, then we’ll have the series where fans decide that it’s not as good as it used to be, then we’ll have a final series where it has nothing to lose and finds its funny bone again. And until then I shall continue to enjoy it, but a quick word to the show’s producers: I know that’s not a laugh track, I know the show is filmed before a live audience, but I also know that you’re not above maybe enhancing the laughter to make a point. Calm it down a bit. Have the courage of your convictions. It’s a good show. Too much hysteria can be off-putting for this reserved Brit. If I’ve missed any, then please feel free to set me straight! **I know far too many people (mostly Brits) who tell me that they don’t get Seinfeld and don’t like the characters, but you’re wrong and one day I’ll sit you down and explain it to you.